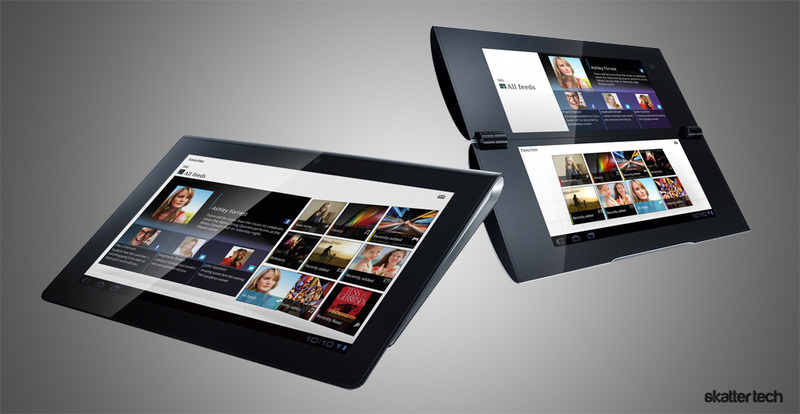 Earlier today, Sony announced plans for two tablets that will become available in fall 2011. Currently going with codenames, the S1 and S2 tablets will sport the latest Android 3.0 Honeycomb operating system. Both models will offer 3G, 4G, and WiFi connectivity for staying connected at all times. The S1 sports a 9.4 inch display while the S2 has two 5.5 inch displays, making it a dual screen device. Rather than going for a traditional tablet form factor, the S1 features a uniquely contoured body for a better grip. Taking some inspiration from the Kyocera Echo smart phone, the S2 will let users run two different apps on each respective display simultaneously. “Android 3.0 is a new version of the Android platform with a new holographic user interface that is designed from the ground up for devices with larger screen sizes, particularly tablets. I’m excited about ‘Sony Tablet’ as it will further spur the development of applications and network offerings which users are looking for.” said Andy Rubin – SVP Mobile, Google Inc. These two tablets will also come with access to Sony’s new Qriocity music and video services in addition to the recently announced PlayStation Suite for high quality gaming on the go. To complement Google Books and third-party apps such as Amazon Kindle, Sony will also give users access to its own Reader Store. For those who own Sony Bravia HDTVs or other entertainment equipment, these tablets will work as universal remotes for controlling playback. Sony even notes that they plan to bundle their own DLNA client for streaming multimedia over a home network. I am looking forward to getting my hands on the S1 tablet, but the dual-screen S2 brings some concerns. Since Android 3.0 does not support multiple displays out of the box, it means Sony will customize the device with additional software. This can lead to delayed software updates and an inconsistent experience. For instance, the Kyocera Echo only makes dual screen functionality available for about six applications. Although I am sure that Sony will provide APIs to let developers take advantage of the two screens, I doubt that companies will waste resources to tweak apps for just one proprietary tablet. As seen in the official product shots, the S2 tablet will likely have a rounded form factor when closed. It could be difficult to pack in bags not to mention holding when open. I would not be surprised to see Sony dump the S2 and place all focus on the more traditional S1 model. The press release provides no details on pricing or any hardware specifications for that matter. To stay updated when more information becomes available, feel free to subscribe.